Digital reprint of rare Victorian clothing catalog. This ebook is a digital reprint of an 1886 Victorian clothing catalog featuring a winter collection of outerwear from a New York company. Each page of this ebook was scanned and published in PDF format. It is MAC and PC compatible. The ebook can be opened, viewed and printed. All original “century old” images were digitally restored for clarity. The text and images can be enlarged and viewed in close-up detail on a computer (a valuable feature for the researcher, collector and historian) or printed to read separately. Did you know that you can explore the Victoriana Magazine Facebook page, including our photo albums, without joining? By becoming one of our 8,00 fans, you can enjoy access to free downloads which include several ebooks, crafts, cards, prints, paper dolls, and stationary. 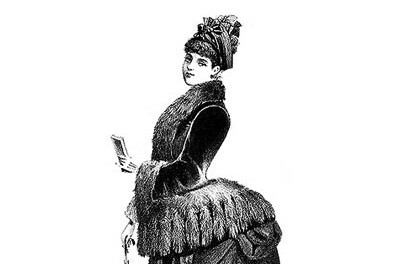 No description of 19th century women’s fashions would be complete without some mention of the notorious lady, Amelia Jenks Bloomer. Free 1899 fashion plate to print and frame.